He said the people whose lives were “chewed up” by capitalism are pushing populism. BONO HAS TOLD the world’s business elite that capitalism is not immoral, but it is a wild beast that needs to be tamed. The U2 frontman participated in a panel discussion at the World Economic Forum in Davos today with Managing Director of the IMF Christine Lagarde, Rwanda President Paul Kagame and others. “We have to just ask ourselves deeper questions about where we are with the project called capitalism,” he said. And, you know, capitalism is not immoral – it’s amoral. It requires our instruction. Capitalism has taken more people out of poverty than any other ‘ism’, but it is a wild beast and if not tamed it can chew up a lot of people along the way. And in fact those people’s lives that it has chewed up are pushing the politics in our homes towards populism. 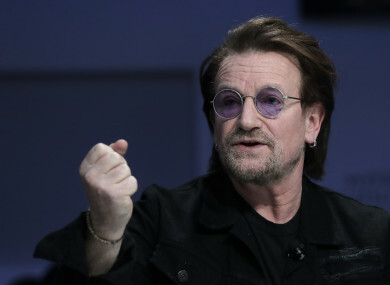 Bono made similar comments during a panel discussion with former British Prime Minister David Cameron at the 2014 World Economic Forum, when he said: “Capitalism can be a great creative force but it can be a destructive force. It is not immoral but it is amoral, we need to give it some instructions”. During the panel discussion today, the singer also spoke about the One campaign, a non-profit advocacy organisation fighting against extreme poverty, of which he is a co-founder. He said the millenials driving this campaign are not loyal to brands, “they’re loyal to ideas”. Great businesses are like species and can be extinct if they don’t evolve and adopt. Email “Bono tells business leaders at Davos: 'Capitalism is not immoral - it's amoral'”. Feedback on “Bono tells business leaders at Davos: 'Capitalism is not immoral - it's amoral'”.